Using data from the Spitzer Space Telescope, researchers observed an unusual protostar that periodically emits infrared light bursts, becoming 10 times brighter every 25.34 days, and suggest that the pulsed accretion may be associated with an unseen binary companion. Amherst, Massachusetts – Just-forming stars, like growing babies, are always hungry and must “feed” on huge amounts of gas and dust from dense envelopes surrounding them at birth. Now a team of astronomers including Robert Gutermuth, a University of Massachusetts Amherst expert in imaging data from the Spitzer Space Telescope, reports observing an unusual “baby” star that periodically emits infrared light bursts, suggesting it may be twins, that is, a binary star. The discovery is reported this month in Nature. 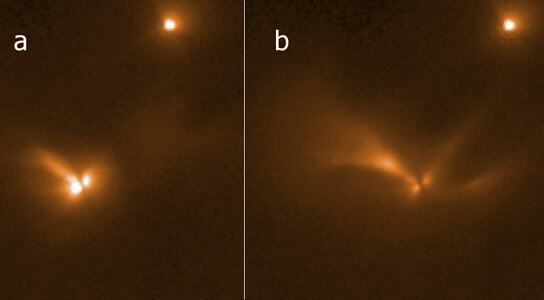 The protostar twins, embedded in a gas “cocoon” many times larger than our solar system, offer an unusual chance to study what looks like a developing binary star system, he adds. Because dense envelopes of gas and dust surround embryonic stars, the only detectable light to escape is at longer, infrared wavelengths. “Spitzer’s infrared camera is perfect for penetrating this cool dust to detect emission from the warm center,” says Gutermuth. The light echo to which Gutermuth refers is seen in images taken at the near-infrared limit of the Hubble’s Wide Field Camera 3 instrument. The lead investigator for this work and the Spitzer study is UMass Amherst alumnus James Muzerolle, now of the Space Telescope Science Institute, Baltimore. The investigators are careful to point out that they’re not sure what is at the center of object LRLL 54361, but if it is an embryonic binary star, the prospects are exciting. Scientists have shown that close binary low mass stars are a somewhat rare outcome of the star formation process. But understanding their formation is critical to address some of the fundamental open questions in star and planet formation, such as how protostars form, how they accumulate their mass and how planets form from their circumstellar disks, Gutermuth points out. It’s believed that most of a central star’s mass is assembled early, whereas planet formation in spinning outer gaseous disks may take several million years to complete. Be the first to comment on "Unusual Protostar Periodically Emits Infrared Light Bursts"